Dep. Defense Minister blasts Spanish hypocrisy, treatment of Catalonia voters, notes Spain's decades-long support for Palestinian statehood. 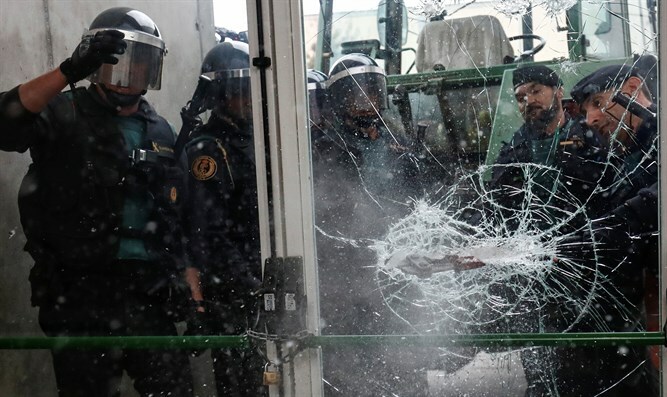 Spanish security forces blocked polling stations across Catalonia, including the regional capital of Barcelona. Police broke into 319 voting stations, local authorities said, and clashed with crowds of voters at other stations. Catalonia, a semi-autonomous region within the Kingdom of Spain, held the referendum vote Sunday, despite protests by the central Spanish government in Madrid, which declared the plebiscite illegal. While most Catalans say a referendum on independence should be held, polls show a majority back remaining a part of Spain.